Returning to my B&B from Keswick town centre at night involves walking along a dimly lit road where cars tend to speed. Wise, longer-lived pedestrians will heed the advice given in safety campaigns and take precautions to be seen at night. A white carrier bag (containing my shopping) did the job for me last night. You can't be too careful. I heard about a chap who took it to the limit - white coat, hat, scarf and gloves; white wellies; a newspaper in one hand and white carrier bag in the other. Sadly, the poor guy was run over by a snow plough. There's still some snow here but it's all on the high hill tops; nothing at the levels that I have reached, which today was just over 1200 feet on a five mile walk over Walla Crag. 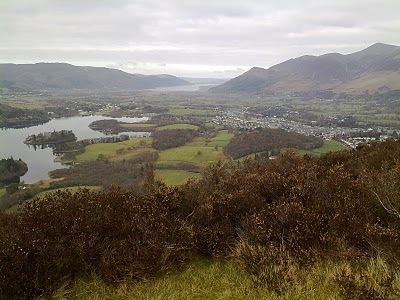 Heading south from Keswick, there's a short sharp final climb up towards the summit and a very steep, rocky descent. 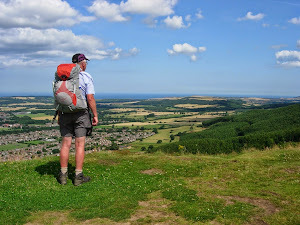 No speeding cars up there to watch out for but you do have to look carefully at where you put your feet on the way down. the water looks flat calm was there any wind ? No wind Danny, the water like glass. 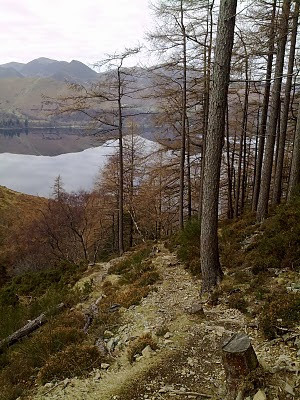 In my opinion, The best variety walk in the Lakes for all without the use of a car to the start.